Dental Implants Restore Teeth and Preserve Bone Structure! Dental implants and traditional dentures are both well-known for their ability to restore teeth. Both can provide you with a natural-looking smile and the ability to enjoy most (if not all) of your favorite foods. However, there are some significant differences between the two tooth replacement options, one of which is related to your bone health. The human body is a very efficient machine. When one part of it isn’t being used to its full potential, it quickly begins to weaken; the jawbone is no exception to that rule. A big part of its job is to support your teeth. It maintains a strong bond with your tooth roots, and together they work to keep the visible part of your teeth functional and steady. However, when you lose your teeth, your body begins to resorb the portion of the jaw that used to support them. In the first year after a tooth extraction, you may lose up to 25 percent of the bone in the area around the extraction site! Although the resorption slows down after the first year, it will continue for many years unless something is done to stop the problem. That’s why it is so important for you to choose a smile restoration option that replaces both the crowns and the roots of missing teeth. Traditional dentures simply sit on top of the gums. Therefore, they do nothing to replace the roots of missing teeth. The way they fit will even change over time due to the bone deterioration that is taking place beneath them. Implant dentures offer a superior solution. Implants are small cylinders, typically made of titanium, that a skilled oral surgeon places within your jawbone. 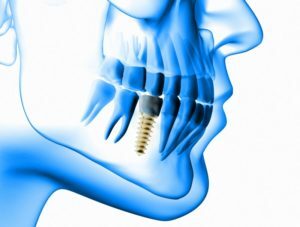 As you heal from the surgery, a remarkable process known as osseointegration takes place — basically, this means that your jaw forms an attachment to the implants. In effect, the implants serve as substitute tooth roots. They can help to prevent much of the bone loss that normally occurs after extractions. Once the implants are stabilized in your body, your dentist will place your new teeth on top of them. You don’t need to receive an implant for every missing tooth. Even if you need to replace an entire arch of pearly whites, it may be possible to do it with just four to six dental implants. Your dentist will evaluate your mouth and design a treatment plan that is as minimally invasive as possible. Are you ready to regain your lost smile? Talk to your dentist about dental implants — they may be the best way for you to restore your teeth and save your jawbone! Dr. Hodong Kwon is deeply interested in implant dentistry; in fact, he is a member of the American Academy of Implant Dentistry! He crafts beautiful restorations to help his patients enjoy the benefits of a full set of teeth. If you would like to speak to Dr. Kwon about dental implants, contact our office at 214-350-8608. Comments Off on Dental Implants Restore Teeth and Preserve Bone Structure!